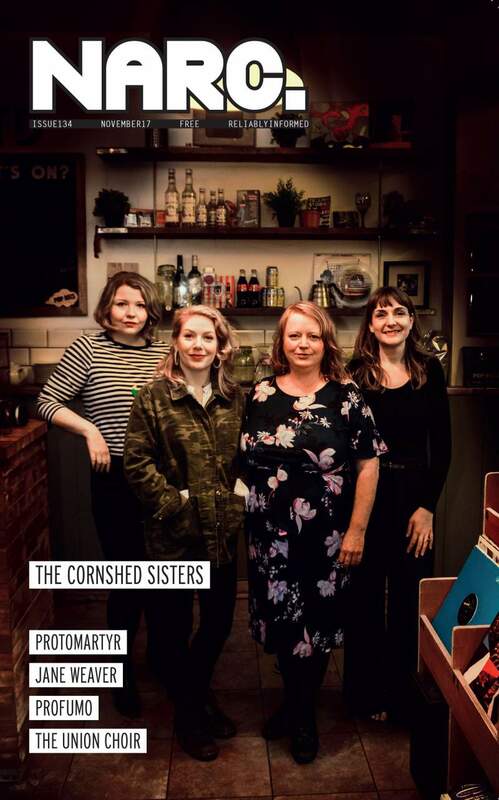 This month’s cover stars are The Cornshed Sisters; Leigh Venus talks to the four-piece about the release of their highly anticipated second album, Honey & Tar, with exclusive photos by Nick Wesson. News-wise, we check out forthcoming gigs from Autobahn at Ku Bar, Amusement Parks on Fire at The Cluny, Euros Childs at Mining Institute, GNAW Fest at The Cluny, Husky Loops at Westgarth Social Club/Think Tank?, Holy Moly & The Crackers at Cobalt Studios, Pale Kids at Empty Shop HQ, The Wolfhounds at The Cumberland Arms, Syd Arthur at Georgian Theatre and much more. In the Culture pages, we have features on this year’s illuminating Lumiere festival of light in Durham; Louise Henry talks art and activism with Nasty Woman Lady Kitt ahead of the inaugural International Nasty Women Conference; Gabrielle Barkess-Kerr finds out what’s in store at Northern Design Festival, a celebration of stunning and innovative design; plus there’s previews of Newcastle Libraries’ Books on Tyne Festival; author Jon Ronson looks at psychopathic behaviour at Tyne Theatre & Opera House; stunning and evocative images of North Korea are on display at Abject Gallery courtesy of photographer Nathalie Daoust; an exhibition of famous faces as you’ve never seen them before heads to Arts Centre Washington; Lefty Scum (aka Josie Long, Grace Petrie and Jonny & The Baptists) get political at The Stand; there’s a whole host of intriguing productions at Alphabetti Theatre courtesy of CaroleW Productions; Northern Stage welcomes several superb new plays, including the ‘Nick Cave of storytelling’ Ben Haggarty’s production The Fate We Bring Ourselves and Powder Keg’s explosive show Morale Is High (Since We Gave Up Hope); plus there’s a look at the newly revamped Fire Station in Sunderland. Interview-wise, it’s a packed month! Steve Spithray talks dystopian melodrama, anti-capitalism and Elvis Presley with post-punk rockers Protomartyr’s Joe Casey; Claire Dupree talks 60s sounds, chanting monks and UFOs with Sunderland’s psych rockers The Sons of Bido Lito; Mark Corcoran-Lettice catches up with Faithful Johannes of Outside Your House about their debut album due this month; Dawn Storey talks to Newcastle-based musician RJ Thompson about the inspirations behind his new album; Becca Fergus talks to Wolf Alice’s frontwoman and songwriter Ellie Rowsell ahead of their Newcastle show this month; Mark Corcoran-Lettice talks to Jane Weaver about her blossoming electronic psychedelia; Eugenie Johnson talks to Profumo about the guerrilla operation behind their new EP and the art of capsizing yacht-rock; Becca Fergus speaks to Colin Newman from rock icons Wire; Mark Corcoran-Lettice finds out more about The Union Choir’s long-in-the-works debut album The Ghosts In The Room; Joe Fowler talks to beatboxing harmonica-playing bluesman Son of Dave; and celebrating their fifteenth anniversary this month, the team from The Cluny put forth their favourite tracks in Mixtape. We review demos by local acts Hivemind, Set Your Sights, GUFRA, Holding Out and Fast Cakes; albums by ONSIND, Yung Lean, Dressed Like Wolves, Autobahn and more, plus reviews of tracks by St. Buryan, SWEARS, Plaza, Be Quiet! Shout Loud and many more. Our review section is chock full of reports from the front row of Twisterella Festival, Gary Numan, Nick Helm, Tusk Festival, Nadine Shah and more.